Mark the Evangelist starts the gospel of Jesus Christ affirming from the very beginning that Jesus came as the Son of God. He proves the divinity of Jesus starting with the extraordinary experience and witnessing of John the Baptist. Isaiah and Malachi had prophesied on the coming of John as the messenger of the Lord to prepare the way for the Messiah. He prepared many people from Judea and Jerusalem to receive the Savior by renewing their lives. They confessed their sins and received baptism from John as sign of their spiritual renewal. John had the privilege to baptize Jesus when John experienced the divine intervention of the Holy Spirit in the form of a dove and the confirmation from God the Father. (Mark 1:1) The beginning of the gospel of Jesus Christ [the Son of God]. (9) It happened in those days that Jesus came from Nazareth of Galilee and was baptized in the Jordan by John. (10) On coming up out of the water he saw the heavens being torn open and the Spirit, like a dove, descending upon him. (11) And a voice came from the heavens, “You are my beloved Son; with you I am well pleased.” . 1. The preaching of John the Baptist to prepare the people for the coming of the Messiah. (Mark 1:2-8). 2. The baptism of Jesus with the extraordinary manifestation of the Most Holy Trinity and confirmation that Jesus was the Christ. (Mark 1:9-11). 3. The temptation of Jesus Christ by Satan in the wilderness (Mark 1:12-13). The Son of God is given only in some manuscripts. It was relevant when Mark finalized the gospel because Jesus whom the apostles were preaching was presented not as a popular teacher or prophet but as Son of God. Mark who was following the teachings of St. Peter gave importance to the divinity of Jesus that Peter had been proclaiming. Though Mark gives reference only to Isaiah, the quote is a combination of prophesies by Malachi and Isaiah: “Now I am sending my messenger - he will prepare the way before me; (Malachi 3:1) and “A voice proclaims: In the wilderness prepare the way of the LORD! Make straight in the wasteland a highway for our God!” (Isaiah 40:3). In fact, both the prophets mentioned almost the same. John’s mission was to prepare the people’s heart through repentance to receive the Messiah. Like the end of the Babylonian exile, Jesus was coming to the end the captivity of the people from the Evil. Though Prophet Malachi prophesied saying “I am sending my messenger,” the usage was a prophetic present. Malachi prophesied around 445 BC to 425 BC. It came into effect only four centuries later. John the Baptist was the messenger who came ahead of Jesus. John was six months older than Jesus. His role was to prepare the way for Jesus, the Messiah in the hearts of the people by his message of repentance, conversion, and baptism. Even his birth and role were prophesied centuries before his birth. Though he was born as the son of a priest Zachariah, he served as a prophet of the Lord. The desert here means the desert between Palestine and Babylonia where John lived and preached. John’s preaching was strong and a cry for the conversion of heart because the people’s hearts were like barren desert producing no spiritual fruit. John’s role was to remove the obstacle of sin that was blocking the road for the Lord to enter into the heart of the people. The new dwelling place of the Lord was the human heart and not the second Temple of Jerusalem where the original Tabernacle and its contents and divine presence were missing. The Tabernacle with its contents were removed from the first Temple by Prophet Jeremiah before the Babylonian exile and were never recovered. (2 Maccabees 2:4-6). Hence, John came, as prophesied, to prepare the human hearts as the new dwelling places of the Lord. The way of the Lord is not the worldly highway that we use for transportation. It is a passage for holy people to reach the Holy Place of God. “A highway will be there, called the holy way; No one unclean may pass over it, but it will be for his people; no traveler, not even fools, shall go astray on it.” (Isaiah 35:8). Angel Gabriel had clarified to Zachariah how John, his son, would prepare the way of the Lord. “He will go before him in the spirit and power of Elijah to turn the hearts of fathers toward children and the disobedient to the understanding of the righteous, to prepare a people fit for the Lord.” (Luke 1:17). John did this by “proclaiming a baptism of repentance for the forgiveness of sins,” (Luke 3:3). He asked people to “produce good fruits as evidence of your repentance.” (Luke 3:8). To the crowds who asked John what to do, he said: “Whoever has two tunics should share with the person who has none. And whoever has food should do likewise.” (Luke 3:11). To the tax collectors he said: “Stop collecting more than what is prescribed.” (Luke 3:13). And to the soldiers who came to him he said: “Do not practice extortion, do not falsely accuse anyone, and be satisfied with your wages.” (Luke 3: 14). So, John had practical advice to prepare the sinners for the reception of the Lord. It was customary that the highways where the kings would pass were widened, hills were cut down and levelled, dips and valleys were filled, crooked roads were straightened and thus all hinderances were removed for a smooth ride. In the spiritual sense, the hindrances of sin had to be removed. The spiritual pride of the Jewish leaders were to be levelled, the crooked ways of the rulers and priests had to be straightened, the spiritual valleys of the sinners and gentiles were to be exalted. (4) John [the] Baptist appeared in the desert proclaiming a baptism of repentance for the forgiveness of sins. 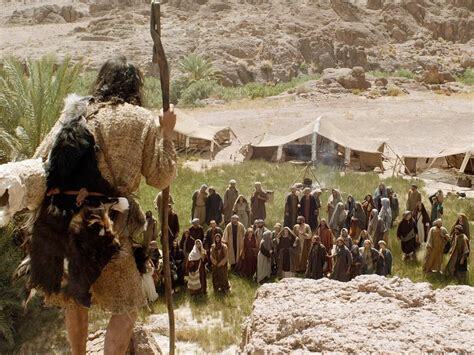 Why John the Baptist selected desert to preach? It is believed that John’s parents took him at an early age from their little town in the hill country of Judea (Luke 1:39) to the Judean desert for safety to save his life soon after King Herod ordered to kill all male children under two years of age. The elderly parents died when John was young and he was then brought up by the Essenes community in the Judean desert. The Essenes were a group of priests who left Jerusalem in disagreement with the governing priests of the Temple of Jerusalem. The priests of the Essenes community moved to the wilderness to prepare for the way of the Lord and concentrated on the study of the Holy Scripture. They were active for about 100 years by the time Jesus started his public ministry. John might have been trained by this group though there is no evidence for it now. Desert has been considered as an ideal place for fasting, prayer, and to be in communion with God. It provided silence, seclusion, non-proximity to material goods, and concentration for prayer. Moses, Prophet Elijah, the Essenes community, John the Baptist, and many early fathers of the church selected desert as perfect place for communion with God. Jesus also selected desert for his spiritual nourishment in preparation for his public ministry. The synoptic gospels record that, immediately after his baptism, Jesus prayed and fasted for 40 days in the desert where devil tempted him at the end of his fasting. After 30 years of his life in the desert, John had emerged as a popular prophet. He was attracting people to to his spirit-filled preaching and call for repentance in preparation to receive the Christ. Baptism of John was not an initiation into any religion or community. It was a physical sign of repentance and renewal of life similar to confession in the Catholic church and some other Christian denominations. It was also in preparation for the baptism of Jesus with the Holy Spirit. Baptism of John with immersion in water and emergence from it became a foreshadow of the death, burial and resurrection of Jesus Christ. Jesus himself used this terminology. “There is a baptism with which I must be baptized, and how great is my anguish until it is accomplished!” (Luke 12:50). This sacrifice of Jesus was to wash or take away the sin of the world. (John 1:29). John’s baptism was also for the forgiveness of sins and a prelude to what Jesus was going to accomplish through the “baptism” of his self-sacrifice. (5) People of the whole Judean countryside and all the inhabitants of Jerusalem were going out to him and were being baptized by him in the Jordan River as they acknowledged their sins. Unlike Jesus, John did not go out to towns or villages. He became famous from the desert and great crowds went to listen to him. The crowds were going to Jesus also for healing for themselves or for their dear ones. John did not perform any miracle. However, his ability to attract such a huge crowd from Jerusalem and the whole countryside of Judea was miraculous. John touched the hearts of his listeners in such a manner that they confessed their sins. They expressed their willingness to change their lifestyle by receiving baptism in the River Jordan. This river is considered as one of the world’s most sacred rivers because of its biblical background and its usage for baptism by John the Baptist and Jesus. This river originates from the slopes of Mount Hermon, feeds Lake Hula that is drained now and Sea of Galilee, and ends up in the Dead Sea. Its length is 230 kilometers or 143 miles. During the separation of Abraham and Lot, Lot selected the valley of Jordan because it was fertile. (Genesis 13:10). The sinful cities of Sodom and Gomorrah were here and the Lord later destroyed those sinful cities. (Genesis 19:1-29). The significance for John to select Jordan for repentance was also because it was the port of entry for the Israelites into the promised land under the leadership of Joshua after the 40 years of wandering in the desert because of their sins. (Joshua 3:14-17). It was a miraculous crossing with the Ark of the Covenant under the guidance and protection of God. Prophet Elisha told Naaman the Syrian to wash seven times in the Jordan for his healing. (2 Kings 5:10). Thus River Jordan became a place for spiritual healing and renewal of life. (6) John was clothed in camel’s hair, with a leather belt around his waist. He fed on locusts and wild honey. clothed in camel’s hair, with a leather belt around his waist. John the Baptist was dressed like a prophet, especially Elijah, probably to reveal to his listeners that he was the expected Elijah before the coming of the Messiah. The description of Elijah’s dress as recorded in the Bible is, “He wore a hairy garment with a leather belt around his waist.” (2 Kings 1:8). John’s arrival as Elijah was already prophesied four centuries before his birth. “Now I am sending to you Elijah the prophet, before the day of the LORD comes.” (Malachi 3:23-24 / 4:5-6). Angel Gabriel had revealed to Zachariah about John: “He will go before him in the spirit and power of Elijah to turn the hearts of fathers toward children and the disobedient to the understanding of the righteous, to prepare a people fit for the Lord.” (Luke 1:17). Jesus also had witnessed that John was the expected second coming of Elijah. “Elijah has already come, and they did not recognize him but did to him whatever they pleased.” (Matthew 17:12). (7) And this is what he proclaimed: “One mightier than I is coming after me. I am not worthy to stoop and loosen the thongs of his sandals. One mightier than I is coming after me. John acknowledged that Jesus, though coming after him, was mightier than him. John was aware of the divinity of Jesus. That was why John cried out: “The one who is coming after me ranks ahead of me because he existed before me.” (John 1:15). Jesus, the Word of God, was mightier because “the Word was God. He was in the beginning with God. All things came to be through him, and without him nothing came to be.” (John 1:1-3). Tying or loosening the thongs of another’s sandals, and carrying them were considered as menial job, usually done by the least in the society like a slave or a servant. John considered Jesus in such a high esteem that he felt himself not worthy even to stoop before Jesus and loosen the thongs of his sandals. Such was the contrast John felt between himself and Jesus. John’s humility and the nobility of Jesus are proclaimed here. John proclaimed that the baptism by Jesus was far superior to the baptism he was giving. John’s baptism with water was a physical cleansing, symbolic of repentance and renewal of life. However, the baptism that Jesus performed was for taking away the original sin that was the root cause of all other mishaps in the world. His baptism was for the cleansing of the soul from the original sin and filling people with the Holy Spirit. The apostles received the Holy Spirit on the Day of Pentecost. Their successors and other Christian faithful received the same Holy Spirit by the baptisms they had performed and through the imposition of their hands. (9) It happened in those days that Jesus came from Nazareth of Galilee and was baptized in the Jordan by John. After his private life in Nazareth for around 30 years, Jesus traveled to the Judean part of River Jordan traveling around 70 miles to officially start his mission with the confirmation from his Father and the Holy Spirit. John who had been preaching about Jesus had to get confirmation that he was the Messiah by witnessing the descent of the Holy Spirit upon Jesus. John had to introduce Jesus to his listeners. Hence, though not a sinner, Jesus went to John at Jordan for baptism. Thus, Jesus who took our sinful flesh appeared humbly in front of John as one among us sinners. (10) On coming up out of the water he saw the heavens being torn open and the Spirit, like a dove, descending upon him. It was after the baptism that the Holy Spirit descended upon Jesus. According to Luke, “After all the people had been baptized and Jesus also had been baptized and was praying, heaven was opened and the holy Spirit descended upon him in bodily form like a dove. And a voice came from heaven, ‘You are my beloved Son; with you I am well pleased.’” (Luke 3:21-22). By specifying “he saw,” the evangelist makes it clear that only John the Baptist saw the opening of heaven and the coming of the Holy Spirit upon Jesus in the form of a dove. Others came to know of it only from the witnessing of John. Mark presents the opening of heaven at the baptism of Jesus as an extraordinary event. The Greek word used for torn open is “schizo.” The English word “scissors” has derived from this word. The image is vivid like what happened at the death of Jesus on the cross, “The veil of the sanctuary was torn in two from top to bottom.” (Mark 15:38). The other occasions when the heavens were opened were for judgement and destruction of sinners. After Noah built the ark, “the floodgates of the heavens were opened” (Genesis 7:11) to destroy the sinners with a deluge while saving Noah and his family. “The LORD rained down sulfur upon Sodom and Gomorrah, fire from the LORD out of heaven” (Genesis 19:24) to destroy the sinners while saving the life of Lot. However, when Jesus was baptized, the heavens were torn open to reveal the Most Holy Trinity. the Spirit, like a dove, descending upon him. John had experienced the torn open of heaven and the Holy Spirit coming down from heaven. He was sure that it was not a regular dove that came upon Jesus, but the Holy Spirit in the form of a dove. The evangelist did not say that the dove flew away afterwards. It descended and remained on him dissolving the shape of the dove. The Holy Spirit, who is the Third Person of the Holy Trinity, was anointing Jesus as the true priest, prophet and king of the world. The Holy Spirit was commissioning Jesus for his mission as he was starting his public ministry. John the Baptist was assured to introduce Jesus as the Messiah to the people. John had testified Jesus saying: “I did not know him, but the one who sent me to baptize with water told me, ‘On whomever you see the Spirit come down and remain, he is the one who will baptize with the holy Spirit.’” (John 1:33). 1. The atmosphere where the birds fly beneath the dome of the sky. (Genesis 1:20). The Psalmist refers to this heaven: “Beside them the birds of heaven nest; among the branches they sing.” (104:12). 2. The dome where God established sources of light including sun, moon, and stars. (Genesis 1: 14-18). The Psalmist refers to this heaven saying: “The heavens declare the glory of God; the firmament proclaims the works of his hands.” (Psalm 19:2). 3. The third heaven is the dwelling place of God and is also known as the highest heavens or the heaven of heavens. Moses told the Israelites: “Look, the heavens, even the highest heavens, belong to the LORD, your God.” (Deuteronomy 10:14). St. Paul had an experience of being taken up to the third heaven where he had the revelation of God. (2 Cor. 12:1-4). He calls this third heaven also paradise. Though Moses saw the glory of God, he did not see the LORD face to face. After giving the Ten Commandments on Mount Sinai, “The LORD said to Moses: This is what you will say to the Israelites: You have seen for yourselves that I have spoken to you from heaven.” (Exodus 20:22). Later Moses told to Israelites: “Out of the heavens he let you hear his voice to discipline you; on earth he let you see his great fire, and you heard him speaking out of the fire.” (Deuteronomy 4:36). While the Babylonian King Nebuchadnezzar was walking on the roof of his royal palace boasting of himself, “a voice spoke from heaven, “It has been decreed for you, King Nebuchadnezzar, that your kingship is taken from you!” (Daniel 4:25-28). St. Peter documented about the transfiguration experience he, James and John had: “For he received honor and glory from God the Father when that unique declaration came to him from the majestic glory, ‘This is my Son, my beloved, with whom I am well pleased.’ We ourselves heard this voice come from heaven while we were with him on the holy mountain.” (2 Peter 1:17-18). While Jesus was troubled on his hour of suffering, he prayed, “‘Father, save me from this hour’? But it was for this purpose that I came to this hour. Father, glorify your name.” Then a voice came from heaven, “I have glorified it and will glorify it again.” (John 12:27-28). Jesus who came from heaven already knew that he was the son of God and the beloved one of the Father. Then why did the Father make that statement? It was to convince John who was assigned to introduce Jesus as the Messiah to the public. So, out of conviction John declared: “Now I have seen and testified that he is the Son of God.” (John 1:34). The Father was well pleased that his Son had completed 30 years of humble life in the world with the ordinary people and then was ready to start his public ministry. It was an assurance to Jesus that the Father was acknowledging his actions and empowering him with His Spirit to go ahead with his mission. A similar voice came for the assurance of the favorite disciples of Jesus on the Mount of Transfiguration. “A bright cloud cast a shadow over them, then from the cloud came a voice that said, ‘This is my beloved Son, with whom I am well pleased; listen to him.’” (Matthew 17:5). Thus, John the Baptist at River Jordan, and the disciples Peter, James and John at Mount Tabor had witnessed the glory of God coming on Jesus, heard His voice acknowledging Jesus as His beloved Son and empowering Jesus stating how pleased was the Father with the work of the Son. 1. Jesus was initiated to Jewish community through his circumcision when he was eight days old. His baptism with water and Holy Spirit was the initiation of his salvific ministry. Through the sacraments of initiation, we become Christians and take up our mission as followers of Christ. Let us keep up our baptismal promises to be faithful to God and to give witness to Christ through his church. 2. John the Baptist was the messenger of Jesus’ mission. The apostles and other disciples of Jesus also became the messengers of Jesus. We have received the message of Jesus through our forefathers in faith. Let us continue to transmit that message to the our contemporaries and to the future generations. 3. John’s message involved making straight the paths of the Messiah and repentance for the forgiveness of sins. Though we are all baptized in water and Holy Spirit, as humans we commit sins. So let us make use of the Sacrament of Reconciliation to make our souls clean and holy for God to dwell within us. 4. John’s exemplary life and his words out of conviction attracted many people in Judea and Jerusalem to him. However, he publicly expressed his humility and directed all his listeners and disciples to Jesus. Our life style, humility and Christo-centric approach are important in our Christian witnessing.